Russian scientists are developing a new technology that could reprocess spent nuclear fuel into a solid form. In October 2014 scientists at Tomsk Polytechnic University announced that they are working on a new solid-state spent nuclear fuel reprocessing technology. In their opinion, it is much safer to store waste in solid form because it prevents radionuclide leakage into the environment. In Russia, most spent fuel is dissolved into acid and converted to a liquid state. Then low- and intermediate-level waste is usually pumped underground or poured into open water bodies at special landfills or nuclear complexes. The most famous among these landfills are Tomsk-7, Krasnoyarsk-26, Dmitrovgrad and the Mayak enterprise in West Siberia. How can Lake Baikal be saved from an ecological disaster? According to Rosatom, the regulator of the Russian nuclear complex, the country has already accumulated some 20,000 tons of its own spent nuclear fuel. This does not include Russia’s disposal of nuclear waste from the European Union and the United States. Russia also possesses about 400 million cubic meters of radioactive waste, 90 percent of which is in liquid form. “We are developing a special technology and an exothermic mixture,” says Dmitry Demyanyuk, deputy director of Tomsk Polytechnic University’s Physics and Technology Institute. “When it is used, there is no need to maintain a high combustion temperature in the system. This blend is mixed in with the necessary proportions and solid radioactive waste and additives that help provide more heat, which is needed for the reaction.” Then the mixture is placed in a special container and ignited. The result is the desired solid material with a porous structure. The Tomsk-based scientists affirm that their technology will be much cheaper than what currently exists. Spent nuclear fuel is not the only serious problem Russia faces. According to specialists, the country also has to deal with toxic waste emitted by industrial enterprises, especially the oil and gas sectors. The existing reprocessing technology for this type of waste is less than perfect. “Everything is very clear with nuclear waste: it’s a first-class hazard and the government controls the situation,” Vladimir Mariev, director of the United Nations Industrial Development Organization (UNIDO) and a waste management expert, told RIR. “Complications mostly arise with industrial waste. In this case, thermal reprocessing methods are predominantly used, often without observing the necessary safety measures,” he added. Russian consumer rights watchdog Rospotrebnadzor said some 2 billion tons of toxic industrial waste have accumulated in Russia. Around 10,000 of those tons are oil sludges. “If you add up the area of all of Russia’s landfills, you get a territory the size of Luxembourg, and it’s continuing to expand,” says Lyudmila Perepechko, who heads the Department of Innovative, Applied and Foreign Economic Activity at the Institute of Thermophysics at the Siberian Branch of the Russian Academy of Sciences. The lion’s share of Russia’s toxic industrial waste is located in the Volga Federal District, which contains an average of over 400 tons of waste per square kilometer. There is also a high level of toxic waste contamination in the Southern Federal District (267 tons per square kilometer) and the Central Federal District (about 211 tons). The situation at Russia’s largest landfill – Krasny Bor – is becoming dangerous. 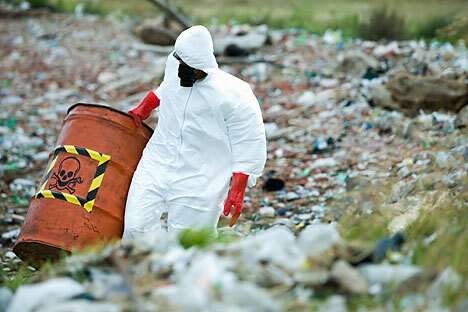 The landfill suspended its operations in January 2014 because its license to reprocess the first four classes of hazardous wastes expired. As a result, thousands of tons of waste have accumulated there. Krasny Bor is only 30 kilometers from St. Petersburg and just 2-3 kilometers away from several towns in the Leningrad Region. The site was chosen back in the 1960s because it houses watertight Cambrian clay deposits. “Soviet academics believed that it was completely safe in the region selected for the landfill, with its thick layers of Cambrian clay,” Director of the Northern Dimension Environmental Partnership Jaakko Henttonen said. “Only after many years did it become clear that the clay isn’t homogenous and toxic wastes are seeping through it.” During heavy rains, chemical toxins drain into the canal, and from there they flow into the Izhora and Neva rivers, on whose banks St. Petersburg lies. Mariev told RIR that chemical and biological technologies are being researched in Russia for their potential use in recycling industrial waste. “There is an idea to use worms and bacteria to reprocess industrial waste,” Mariev said. “However, that research requires time and money.” Recently, the Institute of Thermophysics at the Siberian Branch of the Russian Academy of Sciences proposed repairing damaged soil using humic acids. These are special carbon molecules found in soil, peat and lignite. The institute has come up with methods of modifying their structure to make sorbents out of them for heavy metals and oil.